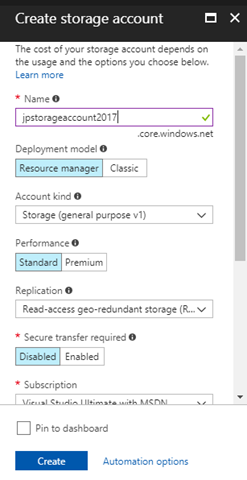 Azure Storage Account – Microsoft Azure Articles.. In this post we can explore Azure Storage Account. Azure Storage Account allows us to create Table, Queue, File, Blob storages. Login to Azure Portal. Go to Dashboard. Click on Storage Accounts tab. You can see the Default Storage Accounts as listed below. For creating a new Storage Account click on the Add button from the top. Click on the Create button & You can see the New Storage Account is created. You can click on the Storage Account to view the Unique URL. Storage Account usage induces Usage charges. Hence wisely make your decision on storage, traffic, edge servers. In this post we have explored Storage Account Creation.